Steven, from Cochrane, was right about the road conditions going South. Flat to start off with then progressing to some hills. Whenever I see hills ahead of me I think back to the “hills” in BC. It makes what’s in front suddenly seem easy. Succumbing to my food cravings I took a break in Matheson at lunch time. I found a cheap place with great tasting burgers. But then everything tastes great when you are in constant need to fuel up. Nothing is really off the menu except for anchovies and Vector bars. Ugh! About 10 km before turning off from Hwy 11 to Hwy 66 towards Kirkland Lake I could just make out a moving object some distance ahead. With my eyes squinting I saw that it was another cyclist going in the same direction. It would take me a while to catch up given our speeds were on par. Going faster and getting closer I discovered there were two cyclists. They were on tour with each bike only having rear panniers. I rode up just behind them, rang my bike bell and said hey. 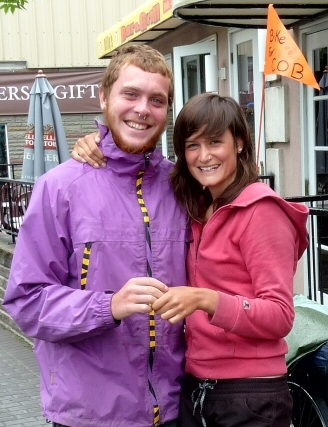 Both 22 years old, Peter is from Guelph, ON and his girlfriend Anna is from Montreal, QC. 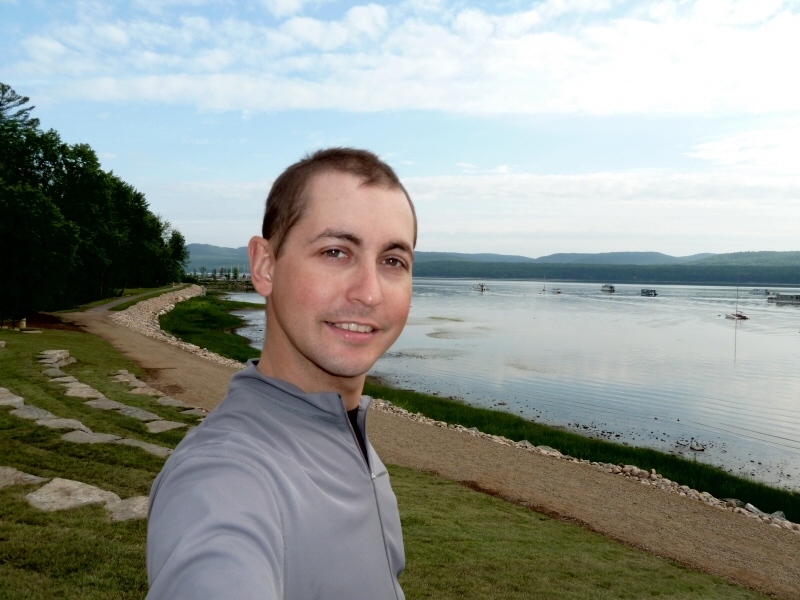 They are biking across the country to raise awareness for AIDS orphans in Africa. We camped together that night and shared some stories. Peter and Anna work together at a trampoline gym and were able to get time off for the trip. They have been on the road since April 11th, 2010. Their food vice on the trip is ice cream, eating it almost daily. I was a bit envious. There have been a few times where during a day off I have been at a grocery store pacing back in forth in front of the ice cream freezer salivating. But they don’t have mocha almond fudge. My food vice is Chewy Chips Ahoy Cookies. They won’t crumble when squished in your food bag and if it’s hot out a couple melt together to form one big delectable treat. Anna and I had something in common. Anytime you meet another touring cyclist on the road one of the questions usually asked is, ‘How many?’. Some have three, others have nine. So far on this trip we have had 0 flat tires. Yep, I’ll spell it out for you, Z-E-R-O flat tires biking 4200+ km so far. Outstanding! The next day we had lunch in town before heading out on the road. It’s not problematic to start the biking day in the afternoon. You just need to have sufficient time to get to your destination and decent weather to not hamper your ride. If it was pouring rain or there was some serious headwind I would stay put for a day. Or go only half way if there was a place to stay somewhere in between. I was surprised to find out that a few times Peter and Anna would leave at 4:30 pm and bike 80-100 km, pushing hard to get to their next stop. There is enough sunlight to do it since sunset is around 9 pm these days. We are all headed to the same destination but are taking our own paths to get there. I was heading South on Hwy 11 through North Bay then onto Ottawa for a week off. They went on Hwy 66 into Quebec through Mt. Tremblant and planned to take a couple days off in Montreal. We exchanged numbers and will text our respective locations in the coming weeks. There is a possibility that we could meet up again. I am taking more time off but bike a just a tad farther each day. Being lucky for not getting a flat tire has come to mind before meeting Peter and Anna. I quickly dismiss my luck and think about other things for fear of jinxing myself. Today however I mused on the issue, “If I was to get a flat tire were should I be?” Maybe in front of a coffee shop? I would be sipping on a cafe mocha making more enjoyable the task of taking my tire off, replacing the inner tube and getting my hands covered in dirt and grease (my bike’s pretty dirty). Or at least in some town where I could sit somewhere comfortably and leisurely change it? I wasn’t going to let the bike tell me where to get the flat, I was telling the bike. I enjoyed reading advertising billboards along the side of the road. It gives you a sense of the expected population size and services offered in the next town or city. The more signs leading up to it, the larger and more developed the town. One sign piqued my curiosity: Thornloe Cheese Factory. I only like a few cheese varieties but I wanted to check this place out. To my surprise they had ice cream for me to indulge in. One of the office staff there, Carmen, was excited to see someone on a bike tour. She took some photos of me with my bike and gave me for the trip a small package of cheese curds high in salt to retain water. Thanks again, Carmen. Just before New Liskeard there’s a tri-city junction with the usual cookie cutter stores you see everywhere. A Wal-Mart, Canadian Tire, motels and some fast food outlets were tempting me. It’s nicer when you go into town. Ha ha ha ha, nice! I woke up to a flat tire this morning. It was my rear tire. And here’s the ‘Martin you’re lucky again’ part. The spare tubes I bought back in Toronto have have the thin presta valves. I thought they were the thicker schrader valves that matched my bike pump. I don’t have an adapter for my pump to inflate the tire. Could you imagine if I had a flat tire where I was in the middle of nowhere, such as the 160 km barren ride from Klotz to Hearst? I would have had to take time to find the hole and patch it up or hitch a ride to a town that hopefully has a bike store or some sports store that sells bike tubes. 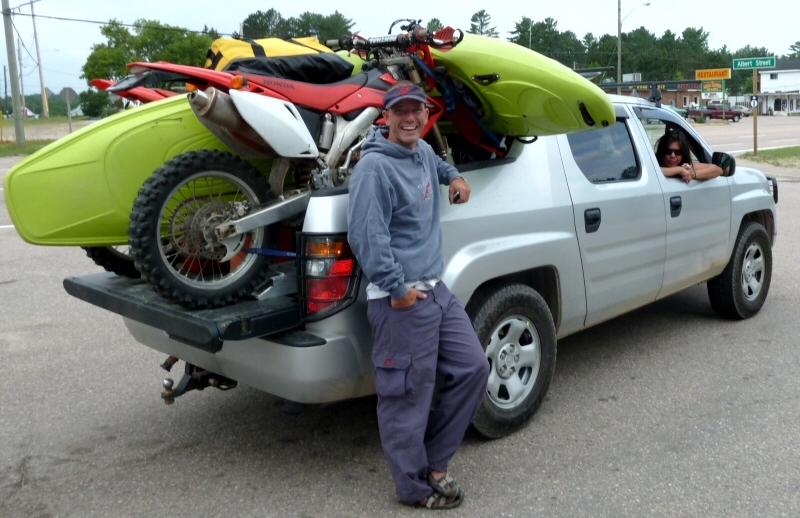 New Liskeard has two bike-sports stores. They both opened at 10 am which gave me time to walk through the town. At the first store, Active 1 Source for Sports, I bought a new tube with a schrader valve for the purpose of replacing my flat. It was slightly thicker rubber to handle the higher PSI. I suspect if you go to a big box store to buy a tube you may get something not up to the task. The owner, Michele, was really nice and was keen to hear about my trip. Her son does a lot of biking. With her passion for the outdoors and biking it made sense for her to own a sports store. They didn’t have the valve adapter in stock so I went to the other shop to purchase. They are $1 each and I bought two in case I lose one. I opted to put the tube with the schrader valve on my bike because it is easier to pump up. I have a tough time with the presta valve adapter. I can never get my ideal PSI. Air usually escapes from the connections between the adapter and my pump. The biking day started off hot and humid then turned into a rainy drizzle. There were plenty of hills and choppy roads that kept my focus in check. Nowadays when I see construction signs ahead on the road I get elated. It means that the road has just been paved making for a smoother ride. Between my suspension seat post, plush saddle and padded shorts I may not feel a lot of the bumps in the road, but my bike does. I was just outside of Temagami where construction had stopped traffic at one end of the road to let oncoming vehicles go through the only available lane. Biking down the hill in the rain I passed stopped cars and trucks. One transport truck had blasted his horn a couple times. ‘What’s he honking at?’ I thought. Then as I looked over at the young driver he had is window down smiling at me, waving and giving me the thumbs up. I get kudos from vehicles at least once a day by either waving and/or giving quick taps on their horns. It’s a nice feeling and gives you the kind of energy boost that performance bars don’t provide. I had originally planned to go to Marten River which is about 40 km South of Temagami. With the lunchtime start, changing weather, hills and my own sluggishness I had called it a day in Temagami. It was not a far ride and I was not impressed with myself. When I arrived at the provincial campground, Finlayson Point, I discovered they had their hot water heater out of order. There were only cold showers available. I considered the cold shower deserving of my poor riding. If I had been more motivated today, I could have enjoyed a hot shower in Marten River Provincial Park. I can’t remember the last time I took a cold shower. I do remember starting it off warm and gradually making it cool. The shower I had this night was quick. Like a little kid jumping and evading a lawn sprinkler or a blast from a garden hose, I did as much as I could to minimize direct exposure to the high pressure blast of cold water. It continued to rain all night and even harder in the morning. It was early morning when I biked to the local coffee shop to fuel up on some caffeine and wait for the rain to subside. I really wanted to make up for my short trip the day before. My plan was to go to North Bay but was open to going further if conditions were good. The rain let up by 9 am and I was off. It’s been a while since I had a hot cup of java. I was riding at a good speed and just before lunch I was halfway to North Bay. I took a break in Marten River to send out a few texts to friends and refilled my water bottle. Back on the road I was happy to see it was paved well and with no hills. Just up ahead I saw a small object directly in front of me moving slowly on the road. A turtle?! 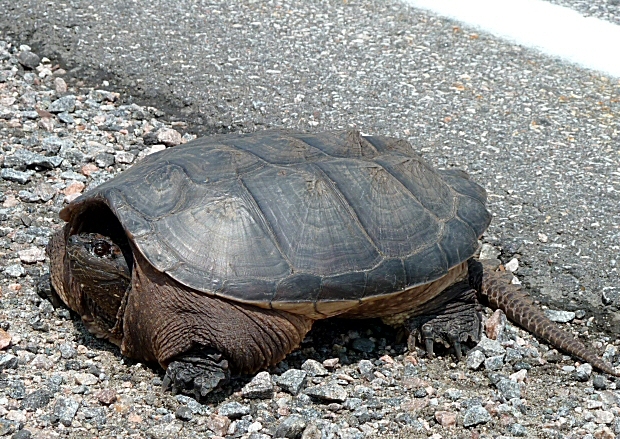 So why is this turtle crossing the road? To get the Shell station, ha! It was big enough, about a foot long. If I had not stopped I would have hit it. I pulled off to the side and rested my bike against a roadway railing. If there was a car behind me or a truck that turtle would have been road kill. I was nudging it with my foot to get it out if the way from passing cars. It didn’t like that and got defensive, hiding in its shell, then aggressive jabbing its head out and jaws open pecking at the bottom of my shoe. With the turtle off the road I went back on my way. I got to North Bay in no time, maintaining an average speed of 25/km hour. There was still time in the day to bike further so I stopped off at the Information Centre to see what type of campgrounds are East along the highway. Unfortunately, the majority of the time when I walk into an Information Centre wearing or holding my bicycle helmet and ask how far is it to the next town, their answer is, “about an hour’s drive”. It’s really a reflex for them. The staff are used to drivers coming in. So I estimate that one hour’s drive is 80 km and if my speed is 20km/hr then it is a four hour ride. Samuel Champlain Provincial Park is about 50 km East of North Bay. It was nothing but hills one after another. My desire to get to Ottawa for a long rest provided me with additional drive and focus to maximize each day’s ride. Usually around the 120 km mark I feel the effects of bicycling. Exhaustion, sore knees and lack of power in my legs become an issue. I stopped for a bit to fuel up on some trail mix. I have noticed it takes about 5 to 10 minutes to get the energy back. Combine it with water and some pain killers and I would be okay for the rest of the ride. Even though I was tired, I enjoyed the scenery that the Mattawa River provided. About 2 km from the provincial park I saw a billboard sign about a campground in Mattawa, 10 km further. Okay then, if I pushed on more I’ll be just a little closer Ottawa. It was a good decision to move on instead of staying at the provincial park. The campground I stayed at offered a great view of the river with my camp site the closest to it. I took a nice hot shower, did some laundry and called it a night. Alternating between long and short rides I took a 100 km ride to Deep River, ON. I chose to sleep in and took my time getting up in the morning. Heading off at lunch time I was again greeted to choppy roads not fit for bike or car, man or beast. I cringe when I ride on these roads. 20 km into my ride I saw a truck pulling a camper trailer stopped on the road’s shoulder. Its hazard lights were on and roadside triangle safety markers set up. It looked like everything seemed to be under control with a woman holding a crowbar between the two rear trailer wheels pulling on it. I asked if she needed assistance. Turns out she did. We introduced ourselves quickly given the ongoing repair. Her name was Sally Ann and her husband’s was Ken. They’ve been touring on the road since December last year traveling from Texas all the way to Alaska. Ken was underneath the trailer replacing a wheel spring that had broken. Pulling the two wheels apart with the crow bar would help to get the spring in. So I took the bar and pulled hard. Two wooden planks protected the wheels from the bar. It gave just enough leeway for Ken to get the spring in. It did take some time. Ken asked me if I noticed the road coming out of Mattawa. “There are paved roads there?”, I joked. He understood that as a yes and the humour helped alleviate his own frustrations. With the trailer repaired we both said our goodbyes and off we went. I could have done a 130 km ride and stopped in Fritzroy Provincial Park for the night. Then the next day do a 70 km ride to my friend’s place in Ottawa. I had emailed my friend the day before and said that it “would take me two days to get from Deep River to Ottawa, unless there’s a Starbucks every 50 km and the roads were completely flat, lol”. I was up at 5 am but didn’t technically leave Deep River until 8 am. I took the opportunity to take in the scenery and some photos by the river before leaving. A grey Dodge pickup truck that passed me on the road caught my eye. Crammed in the back there were two dirt bikes, two kayaks and a third kayak on the roof. I got the impression that the people in the truck have or had a lot of fun activities on the menu. The truck had stopped at a gas station up ahead and I pulled in to take a photo. The driver’s name was Brent and he and his girlfriend conduct kayaking and wilderness tours. I told them I was headed to Ottawa for a week’s break and have an interest in kayaking-camping along the Mattawa River. Brent offered to make it happen. I couldn’t take him up on that offer now but he gave me his contact info should I do so in the future. Thanks, Brent. By 12 pm I had gone 80 km. I took an hour break to rest up, ate some food and filled up my water bottles. Even though there was a slight headwind, the roads were flat and fast. I decided then that getting to Ottawa that night was my goal. I had to take additional breaks during the day. My aim was to be in Ottawa between 7 and 8 pm. This was a realistic time barring any unforeseen circumstances. I took Hwy 17 until it turned into the Hwy 417 then headed through Marathon Village and Carp. I made a quick change and starting pumping up the tire. I only had the spare tubes with the thinner presta valves left. I had to play with the adapter so air wouldn’t escape. My bike pump has a flexible telescoping rubber line that attaches to the valve, a swing out foot stand for support and a pump handle you can use two hands with. Although I don’t have a gauge on my pump I can sort of figure out how much pressure I have by feeling how solid the tire is and how much effort I end up pumping the air in. After, when I start biking I can then feel what rolling resistance there is and if more pressure is needed. This has worked for me during this trip so far. I didn’t even come close to how hard I pump when the tube ruptured and popped out like a gunshot. My ears were ringing for a minute and some people opened their front doors in the houses across the street to see what happened. I took out the tube and saw a three inch tear in it. “Okay, relax”, I thought to myself. I have two more spare tubes…with presta valves. 😦 I was delayed for a while. I put another new tube in and couldn’t ramp up my PSI high enough. I was only able to get half the pressure I needed (max 85 PSI). I could ride with it but there would be much more surface contact, rolling resistance and effort for me to bike at my normal speed. So be it. It was getting late and I had 40 km more to go. I continued to bike with the lower pressure in the front tire. Feeling frustrated (stupid tire!) and desperate to get to Ottawa before dark worked my favour. I was cranking my bike harder and faster. The last time my legs muscles had a tough workout was in BC. So far that hasn’t changed. It wasn’t too hard to maintain a good speed from channeling my frustrations into my legs. I arrived in Ottawa just as the sun was settling below the street lined trees ready to touch the horizon. But I still needed to get to my friends’ house, some 20 km away. I was riding behind a pair of city cyclists who were out for a late day ride. They saw my gear and we chatted a bit as we rode East along one of Ottawa’s main arterial roads. I told them I was headed to South Keys and they gave me directions. Normally I would stop and check my map first to get the best street route my gut instinct was telling me. But heck, they live in Ottawa and know the area better than I. So I followed their advice…..and ended up taking the scenic route, or slight detour, however you want to look at it. I have been on the road for 13 hours, so to me it was a detour. I’ve had enough scenery for the day thank you very much. I was surprised at how much energy I still had. I was biking between 25-30 km/hr in my current bike’s condition. Even though I traveled 200 km and arrived at my destination after dark I felt I could do another 50 km. I will be hanging out with friends this week and enjoying some of the Canada Day festivities, including a BBQ. 🙂 Then I’ll be heading out on the road again on the 4th or 5th of July. My bike needs new treads, more tubes, maybe new brake pads and a tune-up (truing), as well as some gear/kit and clothing adjustments. I have a question to the cyclists out there. I have 32C wheels with no tread left. Should I get another pair of 32’s with max 85 PSI or maybe try a 28C with 100 PSI and up for less roll resistance. Will the thinner tire increase my probability for flats? Or should I get the 32’s since I am already used to it? My bike with gear weighs 75-80 lbs. And my weight has decreased significantly to 150 lbs. With only 2,300 km to go I should complete the trip before the end of July. Piece of cake (knock on wood times 1000)!